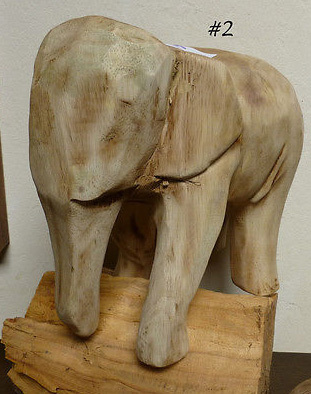 Here’s your opportunity to own a large hand-carved mango wood elephant crafted in Thailand. There’s actually an entire herd of these gorgeous elephant figures, but they are finding homes fast and will only be available to adopt for a short time. The elephant shown in this photo is called #2. She weighs 3 lbs and is 9 inches tall. The beautiful mango wood gets darker as finish is applied. Right now, #2 has only a light application of clear oil. You can bid on this wonderful carved elephant right now. Don’t dawdle… the first bid has already been received. This eBay auction ends next Monday (Feb 2) at about 4 PM. After that you’ll likely be out of luck. Not only will you be acquiring a unique work of hand crafted art, but you’ll also be helping to support a real elephant hospital in Thailand. Friends of the Asian Elephant (FAE) Elephant Hospital treats sick and injured elephants at no cost to their owners and depends on donations from caring people worldwide. Jody Stickney is donating 100% of this sale to FAE, so your money will go far… and you’ll have a valuable elephant too! You can visit the eBay auction for elephant #2 and see pictures of the other available eles right now. Hurry, she could find a new home at any moment. Note: 2/5 update. I’m happy to say that I’m the proud winner of the auction for elephant #2 (shown above) She should arrive in the next few days. Don’t worry if you’ve missed out on any of the auctions to date. There are more eBay auctions in progress right now to benefit FAE. This entry was posted in Fundraising, General and tagged art, auction, carving, eBay, elephant, elephants, FAE, figurine, Friends of the Asian Elephant, fundraising, wood on January 27, 2015 by johnshepler.